I have written in recent posts that oil limits are more complex than what many have imagined. They aren’t just a lack of a liquid fuel; they are inability to compete in a global economy that is based on use of cheaper fuel (coal) and a lower standard of living. Oil prices that are too low for oil exporting nations are a problem, just as oil prices that are too high are a problem for oil importing nations. We have many Main Street Media (MSM) paradigms that mischaracterize our current predicament. But we also have what I would call Green paradigms, that aren’t really right either, because they don’t recognize the true state of our predicament. What we need now is new set of paradigms. Let’s look at a few common beliefs. As I stated above, indications that oil supply is a problem are confusing. MSM seems to believe, “If the US can be oil independent, our oil supply problems are solved.” If a person believes the goofy models our economists have put together, this is perhaps true, but this is not true in the real world. Without a huge, huge increase in US oil production (far more than is being proposed), being “oil independent” simply means that we are unable to compete in the world market for buying oil exports. 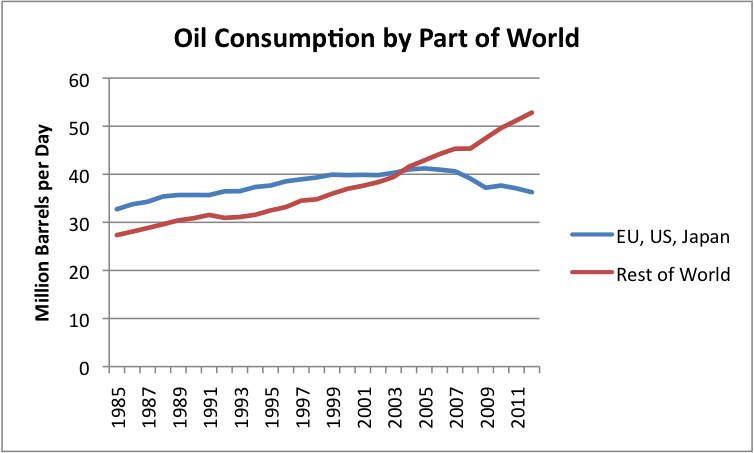 US oil consumption ends up dropping, and we end up on the edge of recession, or actually in recession. Oil exports instead go to the countries that have lower manufacturing costs (that is, use oil more sparingly). See Figure 1 below. In fact, even some of the oil products that are created by US refineries end up going to users in other countries, because it is businesses in other countries that are making many of today’s goods, and it is these businesses and the workers they hire who can afford to buy products like gasoline for their cars or diesel for their irrigation pumps. The Green version of this paradigm seems to be, “If world oil supply is rising, everything is fine.” This is related to the idea that our problem is “peak oil” production caused by geological depletion, and if we haven’t hit peak oil production, everything is more or less OK. In fact, the limit we are reaching is an economic limit, that comes far before world oil supply begins to decline for geological reasons. See my post, Low Oil Prices Lead to Economic Peak Oil. The real paradigm is, “Limited oil supply leads to financial collapse.” This is true for both oil exporters and for oil importer. For oil importers, the problem occurs because they cannot import enough oil, and oil is needed for critical parts of the economy. The belief by economists that substitution will take place is not happening in the quantity and at the price level (very low) that it needs to happen at, to keep the economy expanding as it has in the past. Limited oil supply first leads to high oil prices, as it did in the 2004 to 2008 period; then it leads to government financial distress, as governments try to deal with less employment and lower tax revenue. By the time oil prices start falling because of the poor condition of oil importers, we are well on our way down the slippery slope to financial collapse. In a finite world, this paradigm is obviously untrue. At some point, we start reaching limits of various kinds, such as fresh water limits and the inability to extract an adequate supply of oil cheaply. Economists base their models on the assumption that the economy only needs labor and capital; it doesn’t need specific resources such as fresh water and energy of the proper type. Unfortunately, substitutability among resources is not very good, and price is all-important. In the real world, growth slows as resources become more expensive to extract. We are very dependent on fossil fuels for making our food supply possible and for our ability to make metals in reasonable quantity. Fossil fuels are also necessary for making concrete and glass in reasonable quantities, and for making modern renewable energy, such as hydroelectric dams, wind turbines, and PV panels. We cannot keep 7 billion people alive without fossil fuels. Perhaps the quantity of fossil fuels consumed can be temporarily reduced from current levels, but with continued population growth, any savings will be quickly offset by additional mouths to feed and by the desire of the poorest segment of the population to have the living standards of the richest. Unfortunately, the correct version of the paradigm seems to be, “Overshoot and collapse is to be expected.” This is what happens in nature, whenever any species discovers a way to way to increase its energy (food) supply. Yeast, when added to grape juice will multiply, until the yeast have consumed the available sugars and turned them to alcohol. They then die. The same pattern has happened over and over with historical civilizations. They learned to use a new approach that allowed them to increase food supply (such as clearing land of trees and farming the land, or adding irrigation to an area), but eventually population caught up. Research shows that before collapse, they reached financial limits much as we are reaching now. The symptoms, both then and now, were increasingly great wage disparity between the rich and the working class, and governments that needed ever-higher taxes to fund their operations. Eventually a Crisis period hit these historical civilizations, typically lasting 20 to 50 years. Workers rebelled against the higher taxes, and more government changes took place. Governments fought wars to get more resources, with many killed in battle. Epidemics became more of a problem, because of the weakened condition of workers who could no longer afford an adequate diet. Eventually the population was greatly reduced, sometimes to zero. A new civilization did not rise again for many years. 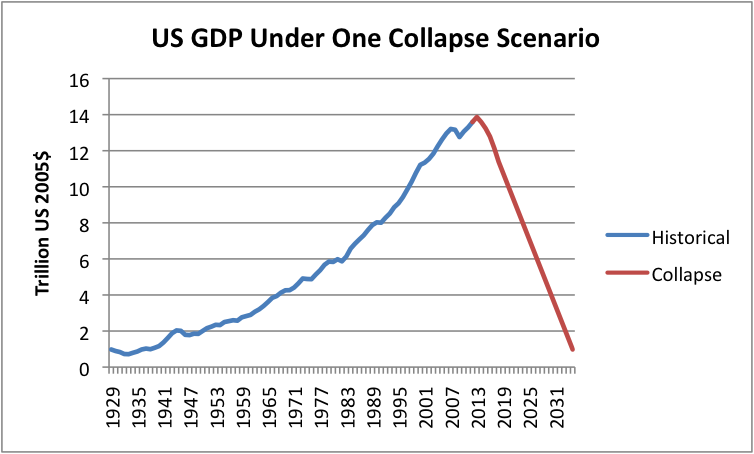 It seems to me that unfortunately overshoot and collapse is the model to expect. It is not a model anyone would like to have happen, so there is great opposition when the idea is suggested. Overshoot and collapse is very similar to the model described in the 1972 book Limits to Growth by Donella Meadows and others. The MSM paradigm seems to be, “Economics and the businesses that make up the economy can solve all problems.” Growth will continue. New technology will solve all problems. We don’t need religion any more, because we now understand what makes people happy: More stuff! As long as the economy can give people more stuff, people will be satisfied and happy. Economics even can allow us to find “green” solutions that will solve environmental problems with win-win solutions (assuming you believe MSM). The Green version of the paradigm seems to be, “Science and technology can solve all problems, and can properly alert us to future problems.” Again, we don’t need religion, because here we can put our faith in science to solve all of our problems. I am not sure the Green version of the paradigm is any more accurate than the MSM media version. Science is not good at figuring out turning points. It is very easy to miss interactions that are outside the realm of science, and more in the realm of economics–for example, the fact high-priced oil is not an adequate substitute for cheap-to-extract oil, and it is the lack of cheap oil that is causing a major portion of today’s problem. It is also very easy to put together climate change models that are based on far too high assumptions of the amount of fossil fuels that will be burned in the future, because economic interactions are missed. If debt collapse brings down the economy, it will bring down all fossil fuels at once, meaning that the vast majority of what we think of as reserves today will stay in the ground forever. A debt collapse will also affect renewables, by cutting off production of new renewables, and by making maintenance of existing systems more difficult. Because of our propensity toward overshoot and collapse scenarios, humans have a real need for a “moral compass” to tell us what is right and wrong. If there is no longer enough food to go around, how do we decide which family members should get it? Is it OK to start a civil war, if there are not enough resources to go around? There is also a need to deal with our many personal disappointments, such as finding that the advanced degrees we worked so hard on will have little use in the future, and that life expectancies are much lower. Perhaps there is still a need for religion, even though many have abandoned the idea. The “story line” of religions may not sound exactly reasonable, but if a particular religion can provide reasonable guidance on how to handle today’s problems, it may still be helpful. The MSM view of climate change seems to vary with the country. In the US, the view seems to be that it is not too important, and that it can be adapted to. Perhaps the models are not right. In Europe, there is more belief that the models are right, and that local cutbacks in fossil fuel consumption will reduce world CO2 production. The Green view of climate change seems to be, “Of course climate change models are 100% right. We should rationally be able to solve the problem.” There is only the minor detail that humans (like other species) have a basic instinct to use energy resources at their disposal to allow more of their offspring to live and to allow themselves personally to live longer. Unfortunately, a more realistic view is that climate change may indeed be happening, and may indeed by caused by human actions, but (1) we are already on the edge of collapse. Moving collapse ahead by a few months will not solve the climate change problem, and (2) collapse itself is an even worse problem than climate change to deal with. By the time rising ocean levels become a problem, population is likely to be low enough that the remaining population can move to higher ground, and agriculture can move to where the climate is more hospitable. Climate change may indeed cause population to drop even more than it would if our only problem were overshoot and collapse. But because the cause is related to human instincts (having more offspring than needed to replace oneself and the drive to use energy supplies that are available), changing the underlying behavior is extremely difficult. Over the eons, the earth has been cycling from one climate state to another, with one species after another being the dominant species. Perhaps natural balances are such that the time has now come that humans’ turn as the dominant species is over. The earth is now ready to cycle to a state where some other species is dominant, perhaps a type of plant that can use high carbon dioxide levels. If this is the case, this is another disappointment that we will need to deal with. In a way, the MSM paradigm of “Our problem is getting the economy back to growth,” has some truth to it. We are slipping into financial collapse, and in a sense, getting the economy back to growth would be a solution to the problem. The underlying problem, however, is that oil supply is getting more and more expensive to extract. This means that an increasing share of resources must be devoted to oil extraction, and to other necessary activities (such as desalinating water because we are reaching fresh water limits as well). As a result, the rest of the world’s economy is getting squeezed back. See my post Our Investment Sinkhole Problem. Squeezing the world’s economy creates great problems for all of the debt outstanding. The likely outcome is widespread debt defaults, and collapse of the world economy as we know it. The Green paradigm seems to be, “We have a liquid fuel supply problem.” If we can solve this with other liquid fuels, or with electricity, we will be fine. Many Greens also emphasize the climate change problem, so their big issue is finding electric solutions for the liquid fuel supply problems. There is also an emphasis on local food production, especially with respect to perishable foods. Unfortunately, the real problem seems to be, “We are facing a financial collapse scenario that is likely to wreak havoc on all energy sources at once.” Using less oil products may be helpful for a while, but in the long term, we are dealing with an issue of major system collapses. Using less of a particular product “works” as long as the supply chain for that product is still intact, including the existence of all of the factories needed to make the product, and the existence of trained workers to operate the factories. Banks also need to remain open. World trade needs to continue as well, if we are to keep our supply chains operating. The real danger is that supply chains for many essential services, including fresh water, sewage disposal, medicines, grain production, road repair, and electricity transmission repair will be interrupted. As a result, we will need to find local solutions for all of them. The situation we are facing is not at all good. While we can do a little, it will be very challenging to build a new system that does not use fossil fuels. In the past, when the world did not use fossil fuels, the population was much lower than today–one billion or less. Also, in the past, we started simple, and gradually added complexity to solve the problems that arose. This time around, we need to do the reverse. We already have very complex systems, that are too difficult to maintain for the long term. What we need instead is simpler systems that can be maintained with local materials. This is not a direction in which science and technology is used to working. Creating new systems that require only local resources (and a few other resources, if transport can be arranged) will be a real challenge. Areas of the world that have never adopted modern technology would seem to have the bast chance of making such a change. MSM seems to assume that we can save and plan for tomorrow. Greens have a similar view. Perhaps, given the changes that are happening, we need to change our focus more toward to day, and less toward tomorrow. How can we make today the best day possible? What are the good things we can appreciate about today? Are there simple things we can enjoy today, like sunshine, and fresh air, and our children? We have come to believe that we can and will fix all of the problems of tomorrow. Perhaps we can; but perhaps we cannot. Maybe we need to simply take each day as it comes, and solve that day’s problems as best as we can. That may be all we can reasonably accomplish. This entry was posted in Gail Tverberg. Bookmark the permalink.